Planning an exciting DIY project? Writing a shopping list of all the tools and gadgets you want? Don’t forget the goggles. DIY accidents aren’t rare and protective gear – though not cheap – could save you a trip to Casualty. 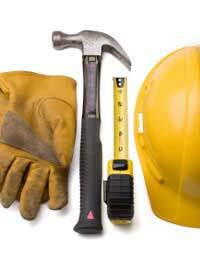 Use our guide to familiarise yourself with DIY safety, and the hazards you could encounter. When you’re cutting corners, don’t cut the budget! You heard right – in the interests of DIY safety, we’d advise spending generously on the right tools. These aren’t necessarily those with the most unusual functions but those with lots of safety features. Ensure that your working area is well lit. Clear any junk and observers from the area! When you’ve finished, disconnect, dry and pack the tool carefully in its box. Most paints are solvent-based, unless you use an organic or eco-friendly brand (of which there are more choices now). When you’re using these, be aware of the risks. Breathing in paint fumes can cause nausea, dizziness or headaches and paint stripper poses additional risks to brain, liver and kidneys on a long-term basis. Dispose of paint responsibly: don’t tip it down the drain. Contact your local authority or see if you can donate it to a good cause. Around 1,000 people suffer ladder-caused injuries in the UK every year! Climbing a ladder is the biggest DIY-related risk – so much that the Health and Safety Executive publishes guidelines on ladders. Check the ladder over before stepping up. Look for damaged steps, wear on the anti-slip feet, or stones or other items lodged in the feet. Touch the steps looking for oil or grease and check there are no missing screws or rivets. Position your ladder away from doors and windows, electrical cables and power sources. Check the ladder’s feet for any obstructions. 75° is the best angle for your ladder. The distance from foot to base of the building should be ¼ of the distance from the bottom of the building to the top rung of the ladder. Make sure the top of the ladder is 1m higher than your required position, and don’t stand on the top three rungs (1m). Keep three points of contact – two feet and one hand – with the ladder at all times. Don’t carry anything you can’t manage with one hand. Don’t over-reach or put your foot on another surface to boost your height. Drilling, too, brings a whole host of potential problems. Fortunately most people aren’t as blasé about wielding a drill as they are about climbing a ladder. When buying, look for a drill with a plastic handle that won’t conduct electricity. Read the instructions to prepare for the job, then put on safety goggles and gloves if you’re drilling something that could irritate your skin. When drilling a very hard surface, make a pilot hole before you begin to drill – and be sure to select the correct drill bit. Don’t leave the drill plugged in when you’ve finished.